REMOTE areas of Siberia and China use thermoelectric generators like the one shown here to convert heat from a kerosene lamp into electricity for radios. The 20-lb. device is being studied by scientists at the Martin Co., Baltimore, Md., where similar direct conversion principles have been applied to nuclear heat sources. They paid $56 for the Russian-built device. A series of thermocouples is arranged around the upper portion of the lamp. As each set of elements is heated at one end by the lamp, a small amount of electricity flows through the pair. Metallic fins remove the excess heat. And by “excess heat” they mean “to produce the temperature gradient required for the thermo-electric effect”. I wonder if this was ever used with solar ? But…. cost per watt advantage? I believe it is actually pretty inefficient. 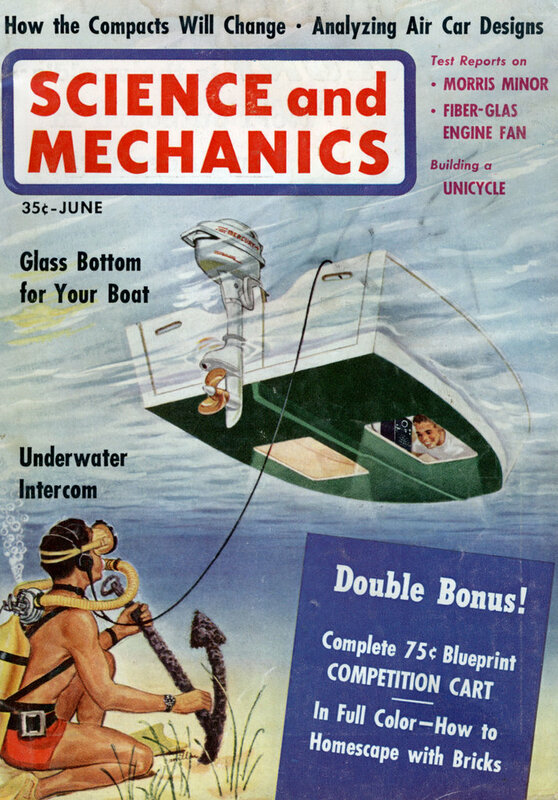 Though I do wonder if such a device was ever considered as an alternative or supplement to the alternator in a car. I suppose it wouldn’t work well until the car was warmed up and you would still need the alternator until then to avoid having to run on the battery. But I would think that once the car was warm you could use it to provide power which would decrease the load on the alternator and thus the engine. Then again, the alternator is such a minor load it probably wouldn’t be worth it anyways. A 200 HP engine is roughly, I believe, 160 KW. At maximum most alternators can’t produce more than about 1500 watts (130 amp is about the biggest you will normally see and many are significantly less than that) and that’s not even 1% of the engine’s output. Even at lower throttle levels it still shouldn’t be significant. Actually TEGs are very efficient. Devices based on these are still powering the Voyager Spacecraft 30 years after launch. It is expected that both spacecraft will continue to have sufficient electrical power to perform experiments until 2020 though each has had some instruments shut down due to lack of available power. I have one of this and is working, i’m from argentina. Somebody know de price of this device? I just purchased a russian kerosene lamp thermoeledtric generator. the unit works very well-it puts out 2,9, 90 volts. iconnected my russian rodina 52 battery powered radio and it plays great with this lamp generator. it lives up to all my expetations. my generator was made in 1958 at the thermoelectricworks plant in moscow,russia. the unit came from lithuania and the person i bought it from said that it was the first on he had seen in 20 years and are very rare. the unit can also be used on american battery radios that require 90 and 1.5 volts. i think all radio collectors that are diverside should have one of these very efficient devices in their collection (my spelling is all that good). sincerely, joseph chambers @ the lithia lab. I am a High School Physics teacher and am looking for one of these Russian Thermoelectric Lamps. I am asking that the previous poster Joseph, or anyone else, contact me at [email protected] if they can put me in touch with someone who has one they want to donate or sell to me for use at school during physics lab discussion of the Seebeck Effect. I am an American, but worked in Russia as an interpeter just after college, and can read and speak Russian in the event anyone has any Russian literature on it. To Firebrand38: I’ve seen those for sale on ebay and haven’t gotten around to buying one yet, but I will. I just thought the Russian Lamp would be cool. Thanks. 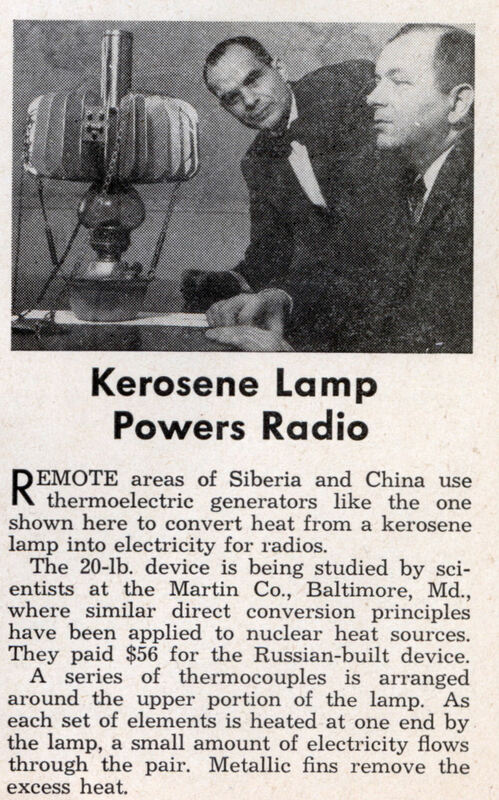 Can you sell a kerosene lamp radio and send it to Argentina?